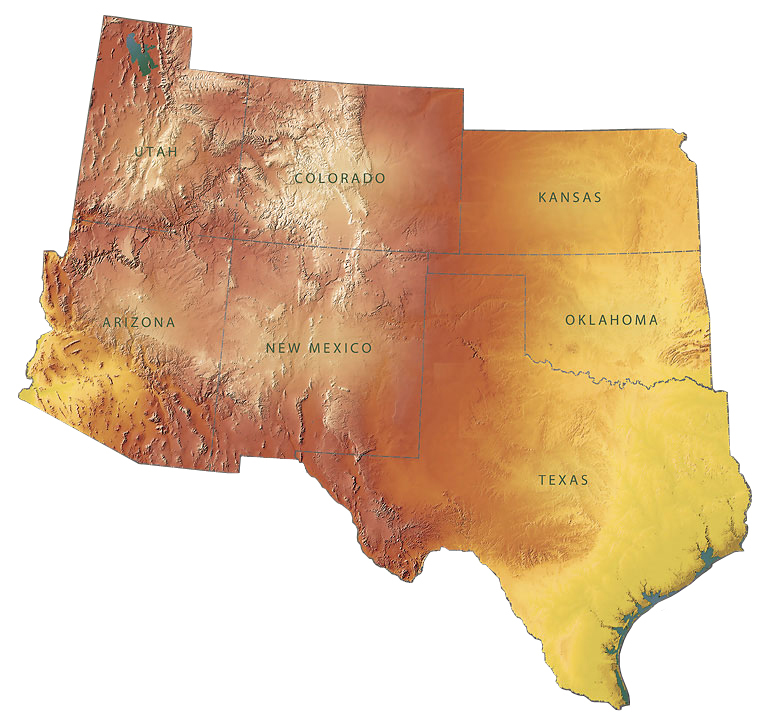 The Grand Canyon National Park Virtual Museum features a number of 3D models. These were created by stitching together a series of photographs to create a digital, interactive model of each. Emil Haury (1904-1992) was one of the great names in Southwest archaeology. The featured model above is of a replica of a Hohokam (central and southern Arizona) artifact made by Haury and dated “8-20-31” on the back. The mosaic consists of turquoise and coral fixed to the outer surface of a clam shell. Naturalist McKee with Leo Weaver and the “Nellie Powell” hull fragment where it was originally found by Weaver. The Nellie Powell was one of three boats used during J.W. Powell’s second expedition through the canyons of the Colorado River (1871-1872). After being left to winter in Lees Ferry, the Nellie Powell was determined to be in too poor of condition to continue the expedition and was instead given to John D. Lee, who used it for a time to ferry passengers across the Colorado River. The Nellie Powell was later abandoned in a field, where most of the boat burned during brush clearing. In 1938, Lees Ferry ranch manager Leo Weaver wrote to Grand Canyon National Park, informing them of the remnant. 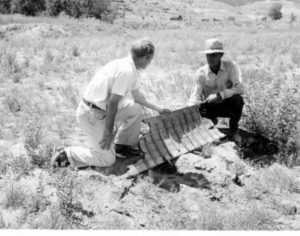 The Park Service sent Chief Naturalist Eddie McKee to retrieve the fragment, which then remained on display at Grand Canyon National Park until 1997, when it was taken off exhibit. Brighty at Wylie Way Camp, ca. 1918 (GRCA Catalog No. 05271). 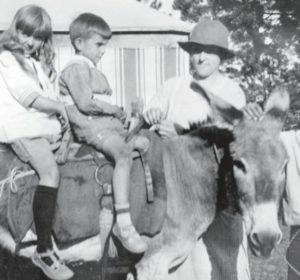 Brighty, a real-life burro that lived in the Grand Canyon from about 1892 to 1922, was raised to fame first in the children’s novel Brighty of the Grand Canyon, written by Marguerite Henry, and later, in a movie by the same name released in 1967. The bronze cast of Brighty featured in the 3D model is of the original promotional sculpture made by Peter Jepsen for Stephen F. Booth Productions and is on display in Grand Canyon Lodge on the North Rim. This bowl is a modern Hopi polychrome made in the 1960s. The bowl is painted with brown and orange decorations on both the inside and outside, and has fire clouds on the bottom and side. In 1909, the Stone Expedition—consisting of Julius Stone, Nathaniel Galloway, Raymond Cogswell (photographer), C.C. Sharp, and Seymour Dubendorff—traveled down the Colorado River from the Green River in Utah to Needles, Arizona in just 38 days. The group wore cork life vests like the one modeled here. These boots were part of the NPS uniform worn by W.R. “Spike” Oakes. Spike worked for the CCC in the 1930s and later joined the Park Service in 1941, when he was appointed as park ranger for Death Valley National Monument in California. In 1956, he transferred to Grand Canyon National Park, and in 1957, moved to Tonto National Monument, where he served as superintendent until retiring in 1965. Split-twig figurines—made from split and folded willow and squawbush twigs—were common in the Grand Canyon and across the Colorado Plateau during the Late Archaic period, some two to four thousand years ago. The figurines typically portray large game animals, some of which are “pierced” with twigs resembling the darts used for hunting prior to the adoption of bow and arrow technology. The figurine presented in this model is made from split willow twigs and retains one straight horn (the other was gnawed off before the figurine was found and collected). The horn in this case may indicate that this particular figurine was meant to emulate a mountain goat. Harrington’s mountain goat (Oreamnos harringtoni) lived in the Grand Canyon during the Pleistocene, becoming extinct around 11,000 years ago. This particular skull was excavated from Rampart Cave, the richest collection of Ice Age fossils known within the Grand Canyon. This dough bowl (reconstructed) was made by Cochiti Pueblo potters in the late 1800s or early 1900s. Decorations include painted geometric designs on both the interior and exterior, a bird on the interior, and a scalloped pattern on the rim. This prehistoric stone axe from the Echo Cliffs area of the Grand Canyon was made by chipping, pecking, and grinding a piece of basalt into shape. The axe shows considerable wear on the bit end, and was likely originally hafted with a handle wrapped around the groove. Click here to see another example of a prehistoric stone axe (GRCA Catalog No. 71924). The Tusayan Ruins at Grand Canyon National Park are the remains of a prehistoric Native American community dating to the late twelfth century. This diorama, which used to be displayed at the Tusayan Museum located next to the ruins, is a conjectural reconstruction of how the buildings may have looked when intact. This pot, featuring an elk or deer, was made by Cochiti Pueblo or Santo Domino Pueblo potters circa. 1890. The Shasta ground sloth (Nothrotheriops shastensis) was a grizzly bear-sized sloth that lived in the Grand Canyon until around 11,000 years ago. This skull was excavated from Rampart Cave, the richest Pleistocene (Ice Age) deposit of fossils yet located within the Grand Canyon. Click here to view the dung of the sample species (GRCA Catalog No. 21967). All 3D models funded through a private grant to the Grand Canyon Association.